The identities of those involved in this accident are as follows: MaKenzle C. Foust, 16, deceased; Brooklyn M. Lindvig, 17, deceased; Jacob R. Logterman, 18, injured. Richland Center, WI - May 15, 2016 - Richland County Sheriff James J. Bindl reports at 2:49 p.m. on Saturday May 14, 2016, the Richland County Communications Center received a 911 call of a roll-over accident on Cty. Hwy A about 3 miles west of St. Hwy 80. Richland EMS, Fire and the Richland County Sheriff’s Dept. responded to the scene. It was discovered that a passenger car had over turned, landing in the south ditch at that location. Two persons were pronounced dead at the scene by the County Coroner. Names of the deceased are being withheld pending notification of next of kin. The investigation continues. 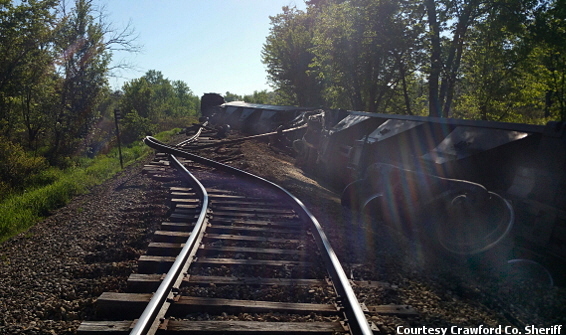 Railroad supplies are staged in Wauzeka Friday, for repair of the roadbed after the recent train derailment. On 05/17/16 at 8:34 PM the Crawford County Sheriff’s Office was notified of a train derailment Approximately 2 miles east of the village of Wauzeka. The train was a BNSF train carrying corn on a Wisconsin Southern rail line. An estimated 150-200 tons of corn was spilled when four rail cars tipped over spilling their load onto the ground and river bank. Vernon County Sheriff John B. Spears reports a shooting occurred Friday, May 20, 2016, at approximately 10:30 PM, in the village of Viola, in Vernon County. The Sheriff’s Office received several 9-1-1 calls of gunshots being heard in the 200 block of West Commercial Street. When officers arrived, they determined an altercation had occurred, on private property, owned by Michael D. McNelly, age 56, of Viola, WI. The incident involved McNelly and Jonathan L. Franks, age 32, of La Crosse, WI. Franks was struck twice in the lower abdominal area and was transported to Vernon Memorial Healthcare, in Viroqua, by the Kickapoo Rescue Squad. McNelly was injured prior to the gunfire and he was also transported to Vernon Memorial Healthcare by La Farge Ambulance. Both Franks and McNelly were later transferred to Gundersen Health System, in LaCrosse, by Tri-State Ambulance. Both Franks and McNelly are expected to recover. Assisting the Sheriff’s Office were the La Farge Police Department, Viola Police Department, Viroqua Police Department, and the Richland County Sheriff’s Office. The incident remains under investigation by the Vernon County Sheriff’s Office and more details will be released as the investigation progresses. 12:48 AM, the Vernon County Dispatch Center received a 9-1-1 call reporting a stabbing occurred at the Pine Crest II Mobile Home Park, in the Town of Wheatland, north of DeSoto, WI. Shayne A. Swadley, age 22, of Readstown, was arrested and appeared via video-conference in Vernon County Circuit Court before Judge Rosborough. Swadley is being held on a $100,000.00 cash bond and has an initial appearance on June 1, 2016. The victim is identified as Christine M. Mazilauskas, age 45, of DeSoto. Christine was stabbed in the neck area multiple times. Christine was transported by Tri-State Ambulance to Gundersen Health System in La Crosse, and remains in critical condition. Swadley is facing charges of either Attempted 1st Degree Homicide or 1st Degree Homicide depending on if Mazilauskas survives the attack. Investigators suspect alcohol and methamphetamines are factors. Assisting at the scene were the Crawford County Sheriff’s Office and Wheatland First Responders. This case remains under investigation by the Vernon County Sheriff’s Office. County Sheriff’s Department investigated a residential burglary at Bjorn Unseth home located at 106 Railway Ave. in the Village of Soldiers Grove. During the commission of the burglary, a gun safe containing six firearms and other miscellaneous items of value was stolen. On December 7th , 2015 a local man while walking on Orchard View Lane found a gun safe in the woods just off the road. The gun safe was matched to the one stolen from the Unseth Burglary. A large hole had been cut in the back of the safe and all the contents had been removed. On May 9th 2016 a local fisherman was fishing in a stream near the intersection of West Point Rd. and CTH B in the Township of Utica and hooked a shoulder strap attached to a rifle. The fisherman was able to retrieve the gun from the water and then notified the Sheriff’s Department. A Serial number from the firearm matched one of the serial numbers of the stolen guns from the Unseth burglary. On Thursday, May 12th, 2016, the Crawford County Sheriff’s Dept. responded and searched the area of the stream near the bridge on West Point Rd. As a result of the search, all stolen firearms from Unseth’s residence were recovered. THE CRAWFORD COUNTY CRIME STOPPERS URGES ANYONE HAVING INFORMATION ABOUT THIS OR ANY OTHER CRIMES TO CALL 326-8933 OR 1-866-779-PAYS. 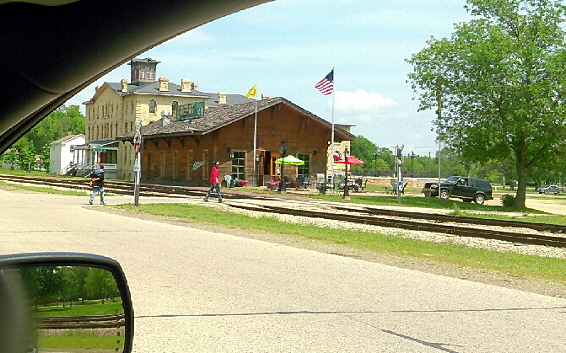 Photo of two people crossing the RR tracks on St. Feriole Island in Prairie du Chien on Tuesday, May 31st., was taken by a person who thought they were acting suspiciously. 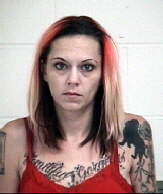 A short time later they were observed being arrested by Prairie du Chien Police along Hwy. 18. Prairie du Chien, WI - On May 31, 2016 at approximately 11:40 a.m. the Police Department was notified of a burglary that had occurred at 201 Water Street in Prairie du Chien. The location is the boat docks off the south side of Lawler Park. The victim notified police that he had interrupted a group of young males removing items from boats parked at the boat docks. The victim was able to provide descriptions of the suspects and a photograph taken with the victim's phone. The victim followed the suspects as they left the area with two backpacks and then came to the police department to file a report. Officers responded to the area where the suspects were last observed and while searching for evidence, two large backpacks were found abandoned. Multiple items of stolen property were found inside the backpacks including: DVD players, car-boat stereos, liquor, handhelds radios and satellite radios. 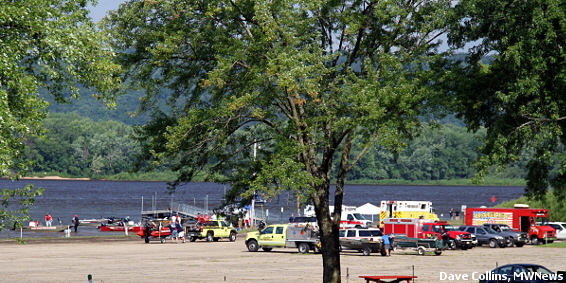 All of these were later identified as being taken from boats located at the boat dock. Based on witness statements, physical evidence and a cellular phone photograph, suspects were taken into custody approx. 2 hours later. A male juvenile was taken into custody and transported to juvenile detention in La Crosse. Two other males, Bradley Kober, age 19 of PdC, and Dakota Samples, age 18 of PdC were arrested for Probation Violations and were book into the Crawford County Jail. Burglary charges will be requested through the Crawford County District Attorney's Office against all parties involved. The case remains open and the investigation continues. Further charges are expected. On June 4, 2016 at 11:57 PM, Clayton County Sheriff’s Deputies along with Garnavillo Fire, EMS and the Guttenberg Ambulance responded to South Front Street near Bill’s Boat Landing in Clayton for a pedestrian who was struck by a train. 39 year old [earlier report stated 37] Jeffery Werger of Garnavillo was struck by a Canadian Pacific train traveling South. He was transported to the Guttenberg Hospital where he was pronounced dead. The incident remains under investigation by the Clayton County Sheriff’s Office. Update - 6/22/16 - In Richland County Circuit Court today, 59 year old Jerome Lux of Richland Center was charged with battery, trespass to land and Disorderly Conduct as a result of a lengthy investigation by the Richland Co Sheriff's Dept. On 6/12/16 Lux and a passenger were driving on Cribbin Hill Rd in Marshall Township when he observed Tom Wagner outside in his yard. Lux stopped in front of the Tom Wagner property and exited his vehicle. Lux made comments to the passenger that he was "going to end this once and for all", then instructed her to take the car and leave the area. Lux then climbed over a locked gate and entered the Wagner property. Tom Wagner was in his yard Lux approached Wagner on foot. A physical altercation happened which caused injuries to both men, injuries which required Lux to be transfered to a Madison hospital by Med Flight. In court today, Lux was charged with 1 count of battery, 1 count of trespass to land and 1 count of disorderly conduct as a result of the incident. He was released on a cash bond. Officials believe this was an isolated incident and there is no danger to the public. Update - The Richland County Sheriff's Department has released further information of a physical altercation that involved a knife early Sunday night. The incident was reported at 6:45 PM on Cribbin Hill Rd. near address 20393. Richland Co received a cellular 911 call asking for Sheriffs Deputies to respond but due to poor signal, not much information could be obtained. The first responding deputy came across a male subject lying along the roadway who was later identified as Jerome Lux, age 59 of Marshall Township. It was determined Lux had received 2 stab wounds, one to the left chest and one to his neck. The Deputy administered first aid and scene security until other Deputies, an RCPD Officer and Richland County EMS arrived. Further investigation discovered another male, Thomas Wagner, age 50 also of RC, lying injured in a nearby driveway. Both men were transported to the Richland Hospital with Lux being transfered by MedFlight to UW Hosp in Madison. Condition update not known. RCSO assisted by RC Police Dept, Richland EMS, Richland Fire and the RC Dist Atty Office. The investigation continues. Boscobel, WI - June 24, 2016 - A bike trail is taking shape (Video) along Hwy 61 between Sander Creek and the Boscobel boat landing. It is the first phase of an ambitious plan to add a trail from Boscobel to Woodman, and perhaps across the Wisconsin River to Wauzeka someday. 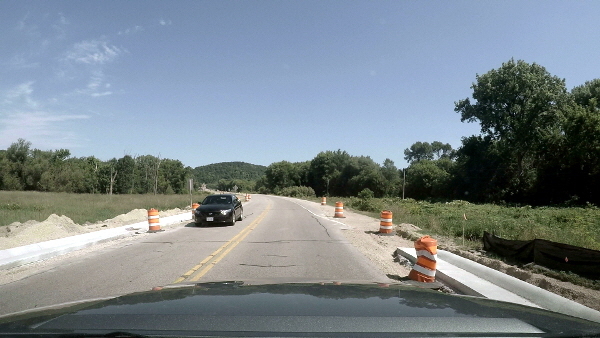 The project, envisioned by a private group, that provided some funds and also received a grant form the Wisconsin DOT. The City of Boscobel will provide some labor by city crews as their contribution. The current walking path along Sander Creek has proven to be very popular, and with this new trail addition, it should be wonderful for tourists and locals for years to come. On Monday, June 27th, 2016, the Crawford County Sheriff’s Department applied for and was granted a search warrant for a residence located on Norma Avenue. in the Township of Prairie du Chien, County of Crawford, Wisconsin. More specifically; Norma Avenue is located within Homesteader’s Trailer Court. Abby Hiles age 33 of Prairie du Chien, Alan Hagensick age 28 of Prairie du Chien, Corey Hagensick age 27 of Prairie du Chien, Anthony Hagensick age 34 of Prairie du Chien, and Monica Knockel age 36 of Prairie du Chien. Also, a one-year-old child occupied the residence. The child was removed from the residence and taken into temporary physical custody for wellbeing and safety reasons by Crawford County Department of Human Services. 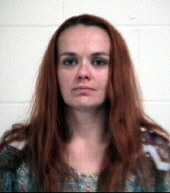 Abby Hiles is being held in the Crawford County Jail awaiting a bond hearing on charges of deliver of methamphetamine, possession of methamphetamine, possession of drug paraphernalia, maintaining a drug house, and recklessly endangering the safety of a child. Alan Hagensick is being held in the Crawford County Jail awaiting a bond hearing on charges of maintaining a drug house, obstructing justice, and recklessly endangering the safety of a child. 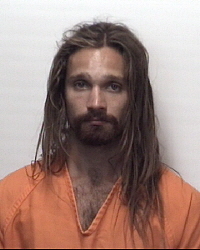 Anthony Hagensick is being held in the Crawford County Jail awaiting a bond hearing on charges of possession with intent to deliver marijuana, possession of psilocybin mushrooms, possession of methamphetamine, possession of methamphetamine paraphernalia, possession of marijuana, and possession of heroin. Monica Knockel is being held in the Crawford County Jail awaiting a bond hearing on charges of possession of marijuana, possession of drug paraphernalia, and possession of methamphetamine. Corey Hagensick is being held in the Crawford County Jail awaiting a bond hearing on charges of possession of marijuana, possession of methamphetamine, and possession of drug paraphernalia. Sheriff John B. Spears reports the arrest of three females stemming from an initial investigation of a suspicious vehicle. The arrests occurred at different locations in Vernon County on the morning of July 1st 2016. The females taken into custody were Misty L. Smith age 35 of Viola, Ashley M. Fish age 28 of rural LaFarge, and Jessica C. Grossell age 30 also of rural LaFarge. On the evening of June 30th at approximately 11:28p.m. a Vernon County Deputy observed a suspicious vehicle in the Village of LaFarge. 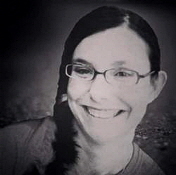 The driver was identified as Misty L. Smith after contact was made. Upon further questioning the vehicle was searched. Located in the vehicle were Methamphetamine, Marijuana, and numerous drug paraphernalia items. Smith was arrested on tentative charges operating while under the influence of a Restricted Controlled Substance, Possession of Methamphetamine, Possessions of Marijuana, and Possession of Drug Paraphernalia. 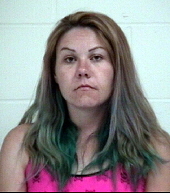 Officers then obtained information to request a Search Warrant at a rural LaFarge residence belonging to Ashley M. Fish. The Search Warrant was granted and executed at approximately 3:16a.m. on July 1st 2016. Located inside the residence were Ashley M. Fish and Jessica C. Grossell. After the residence was searched officers found Methamphetamine, Marijuana, and numerous drug paraphernalia items. Fish was arrested on tentative charges of Possession of Methamphetamine with Intent to Deliver, Possession of Marijuana, and Possession of Drug Paraphernalia. Grossell is tentatively being charged with Possession of Marijuana and Possession of Drug Paraphernalia. 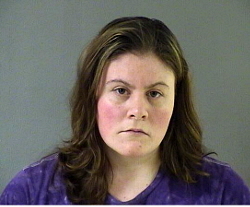 Update - On July 10, 2016, upon details learned from death investigation on July 9, 2016 and subsequent investigation, Renae L. Bellis, 31, Boscobel, WI has been arrested and being held in the Grant County Jail. 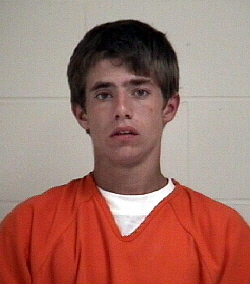 Bellis is being held in jail for 1st Degree Reckless Homicide in the death of a 3 ½ month old female infant. As in the previous news release, there is no threat to the public, as this was a single and focused incident. Bellis was a resident of the location where the incident occurred on July 9, 2016. No further details will be given at this time as the incident remains under investigation by the Boscobel Police Department and the Grant County Sheriff’s Department. Mark T. Rand will be released from custody of the Grant County Jail. All persons alleged to have committed crimes are innocent until proven guilty in a court of law. On July 9, 2016 at 8:24 AM, Boscobel Police Department was dispatched to a residence in the City of Boscobel for a death investigation. An investigation by the Boscobel Police Department and the Grant County Sheriff’s Department resulted in the arrest of Mark T. Rand, age 39 of Boscobel, WI. Rand is in custody at the Grant County Jail for 1st Degree Reckless Homicide of a 3 ½ month old female infant. An autopsy was performed on July 9, 2016 and the investigation is on-going. There is no further threat to the community, as this was a single and focused incident. Rand was a resident of the location where this incident occurred. Further charges may be filed by the Grant County District Attorney’s office. No further details will be given at this time. All persons alleged to have committed crimes are innocent until proven guilty in a court of law. On Saturday July 2, 2016 the Prairie du Chien Police Department responded to a report of a Hit and Run crash that occurred in the 700 Block of North Main Street in Prairie du Chien. Officers arrived on scene and were able to get very detailed information about the suspect vehicle including the license plate number, the direction of travel and a description of the driver. During this time officers assigned to traffic safety grants were used to attempt to locate the suspect vehicle. The suspect vehicle was observed at the intersection of South Main Street and West Wisconsin Street (Or Hwy 18 and Hwy 27). Officers observed the suspect vehicle make several traffic violations that endangered the motorist around them and attempted to conduct a traffic stop on the vehicle. The vehicle continued West on the Hwy 18 bridge towards Iowa. During this time the suspect vehicle nearly hit several other vehicles on the roadway as well as nearly striking the bridge. The suspect vehicle eventually pulled into the Sturgeon Slough wayside and stopped. The driver of the suspect vehicle was uncooperative and refused to provide his name. Prairie du Chien Police Officers were assisted by the Clayton County Iowa Sheriff’s Department and the MarMac Police Department in identifying the driver as Matthew G. Tielbar, age 25, of Guttenberg, Iowa. Tielbar refused to complete field sobriety tests and was arrested for Operating a Motor Vehicle While Under the Influence of Intoxicants (3rd Offense). Tielbar was transported to Crossing Rivers Health for a legal blood draw. During the time at the hospital, Tielbar spit into the mouth of a Prairie du Chien Police Officer. A warrant was obtained to access the evidentiary blood draw and Tielbar was transported to the Crawford County Jail. Charges referred to the Crawford County District Attorney’s Office include: Operating a Motor Vehicle While Under the Influence of Intoxicants 3rd Offense, Operating without a Valid License, and Discharging Bodily Fluids at a Public Safety Official. Tielbar was also cited for numerous traffic related violations. Clayton, Iowa - July 24, 2016, at approximately 11:45 a.m. yesterday, a northbound Canadian Pacific (CP) train entered a section of track that had been impacted by a rockslide near Clayton. The engineer applied the train’s emergency brake, but was unable to stop short of the debris on the tracks. As result of this incident, the lead locomotive and 12 rail-cars on the train derailed. All 12 cars were empty, and all of them are upright. There were no injuries, no dangerous goods involved, and no public safety issues. Teams worked through the night rerailing cars, restoring track to operation, and conducting inspections to ensure train traffic could safely resume. The first train passed through the site at 7:30 this morning. 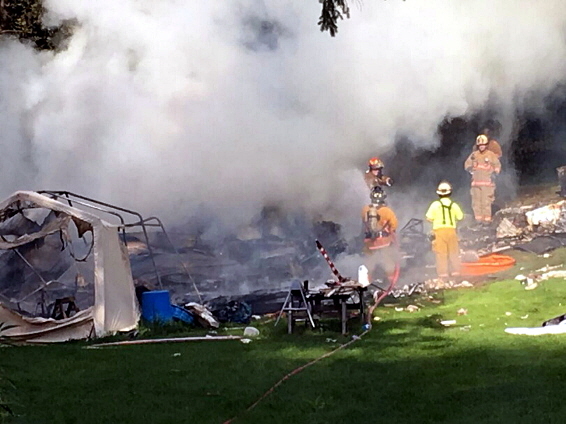 Update - The victim’s names are: Gene A. Zautke, age 54, and Vicki B. Ozelis, age 56, both of rural LaFarge, WI. Vernon County, WI -A house fire was reported to the Sheriff’s Office in the early morning hours of August 1st, 2016. The Sheriff’s Office received two phone calls from citizens driving by the residence and reporting a fully engulfed structure fire that was almost burnt to the ground. The first call was at 6:53am and second was at 6:56am. The house was located off from Valley Avenue, between Burr-Salem Road and County Road P, Valley, in the Town of Forest, Vernon County. The Vernon County Sheriff’s Office 911 Communications Center dispatched the Hillsboro Fire Department, Hillsboro EMS and Deputies from the Vernon County Sheriff’s Office that arrived on scene at 7:26am. Once the fire was contained and no longer a danger, It was determined that the house had been occupied at the time of the fire and it was now a search and recovery effort, for two people that were living at the residence. At this time the names of the deceased are not being released to the public, pending notification to the families. This incident is still under investigation by the Vernon County Sheriff’s Office, the State Fire Marshal’s Office and the Vernon County Coroner’s Office. If anyone has any information about this house fire or had driven past the residence on Valley Avenue North of Valley on Sunday, July 31st, 2016 or early morning hours of August 1st, 2016 prior to 6:53am please contact the Vernon County Sheriff’s Office at 1-(800)637-2123 or (608)637-2124. 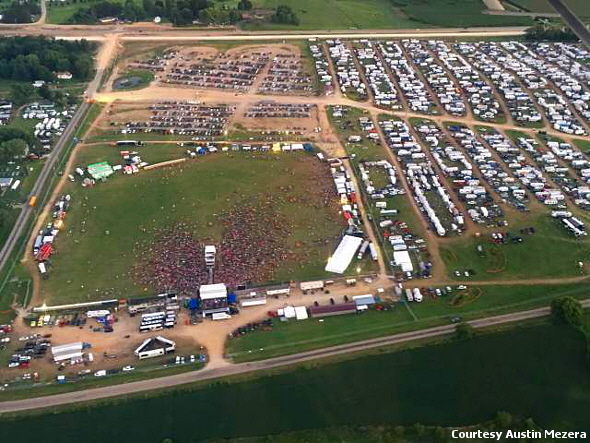 Prairie du Chien, WI - It was feared that with the road construction along Hwy 18/35 that the large crowd attending Country on the River would cause a huge traffic jam, but it wasn’t too bad. The road in the foreground is Bouska Road. (Photo courtesy of Austin Mezera). On August 11, 2016 the Crawford County Sheriff’s Department applied for and was granted two separate narcotic related search warrants in the County. At 12:40 a.m. members of the Crawford County Sheriff’s Department along with members of the Prairie du Chien Police Dept. executed a search warrant at Debra Wetzel’s residence at the Golden Acres Apartment Complex in Soldiers Grove. Wetzel age 58 has been a person of interest in several narcotic related investigations for many months. Items found during the search of her residence were numerous items of drug paraphernalia including syringes, smoking devices, and straws. A digital scale, Liquid Methamphetamine, powdered heroine and opiates along with Marijuana were also found and seized. Wetzel was arrested and charged with Delivery of methamphetamine, Possession of heroin, Possession of meth and meth paraphernalia, possession of opiates, and possession of marijuana and marijuana paraphernalia. Wetzel is currently being held in the Crawford County Jail on a $5,000.00 cash bond. Later in the day at 2:38 p.m. The Crawford County Sheriff Dept. along with members of the Prairie du Chien Police Dept. executed a narcotic related search warrant at the Tina Alexander residence located on Hemlock Street in the Village of Soldiers Grove. Items found at this search warrant were opiates and items of drug paraphernalia suspected to be used in the consumption of opiates. Alexander age 44 is currently being held in the Crawford County Jail on charges of Possession of schedule 2 narcotics and possession of drug paraphernalia. Alexander is currently awaiting a bond hearing. 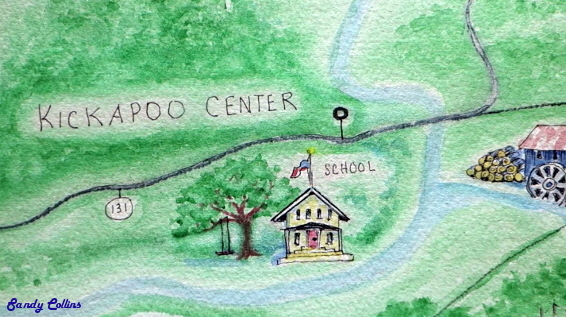 Vernon County, WI – The year was 1888 when a Kickapoo farm family of four was slain during a gruesome home invasion. The cold-blooded nature of the crime stirred area folks to frontier justice. Within a week, the killer was hanging from a tree on the courthouse lawn. Follow the story in this short Midwest News exclusive video documentary. Update - The body of Virginia Aberle has been recovered. 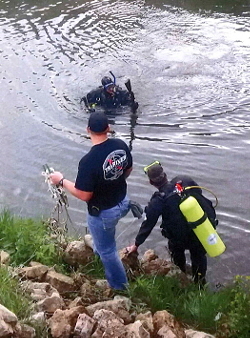 The body was recovered near Glen Haven. Update - After four days of recovery effort, a difficult decision was made to call the search off. The Sheriff’s Office would like to thank the many volunteers who spent countless hours searching for Virginia in the Mississippi. Each day of the recovery, there were anywhere from 10-15 boats and jet skis on the water with over 40 volunteers. There were numerous other volunteers and generous donations of food, water and Gatorade. We ask that anyone boating on the Mississippi between Guttenberg, IA and the Wyalusing Beach please keep their eyes open for the body of Virginia Aberle. If her body should be spotted, please call 911 so that the dispatcher can get you appropriate assistance. 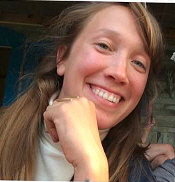 Wyalusing Township, August 3, 2016- On August 3, 2016 at approximately 2:48 a.m., the Grant County Communications Center received a 911 call stating that a 29 year old female, from the Chicago area, was missing from her group of friends that were camping at the Wyalusing Beach. Information was received that she was apparently in the water when she went missing. There were multiple agencies who responded to the scene to assist with the search for the female at the time the call came in. After talking with the others in the group, the investigating deputy determined the female had entered the water and is presumed drowned. A recovery effort was then put into place.